Grief has been described as “a winter of the soul,” a time of feeling alone, underground, frozen. We invite you to experience the hope of a new season by joining us in this local springtime event that allows you to explore, within a supportive community, how possibility can emerge from pain. Whatever your loss—death, illness, relationship, a major life transition — we welcome you. Sam Sather, RN and certified yoga therapist with a talent for helping others cultivate insights of freedom in body, mind and spirit, will offer gentle yoga and mindfulness practices to promote discovery, self-nurture, and deep healing in the midst of loss. 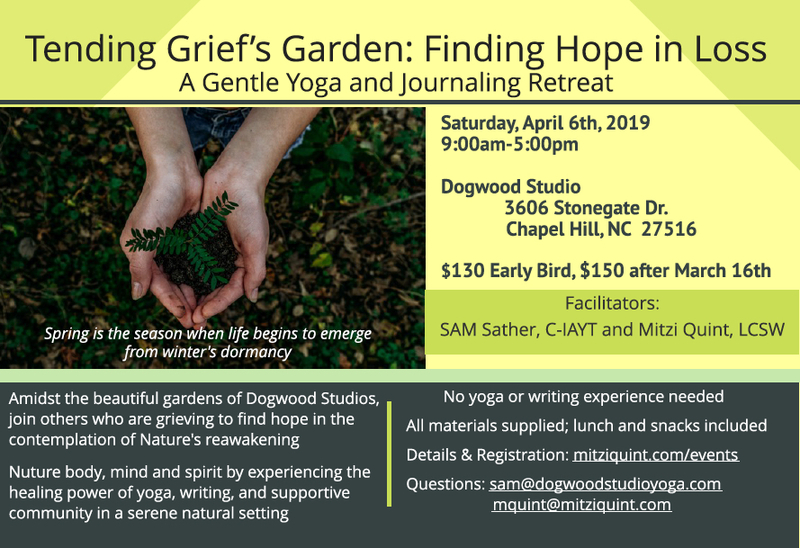 Mitzi Quint, LCSW, a therapist with 20 years experience as a grief counselor, will lead expressive writing exercises to explore both the pain and the transformative possibilities that arise from loss. No yoga or writing experience is needed; both practices are a place to be free to explore and experience without judgement. This is a time for personal reflection; sharing is optional. Yoga props and writing materials supplied, but feel free to bring your favorite journal or pen. Wear comfortable clothing that allows for movement, and layers that allow for temperature fluctuations. Weather permitting, we will be spending time outdoors. There is a short flight of indoor stairs leading to the studio. Enrollment is limited to 14. Early registration encouraged as past retreats have filled quickly. Online Payment via PayPal: The quickest way to confirm your spot is to use the PayPal link here. Please also fill out the Contact Form below. Cancellation Policy: Payment is 50% refundable through March 30, and fully refundable if your spot is able to be filled or in case of illness/emergency. "I really appreciated having a space that was intentionally focused on loss. It was a rare opportunity to be with others who were also there with that." "I didn't realize how much I was holding inside. Being able to release thoughts & emotions through journaling, yoga, & quiet reflection was something I needed." "The Yoga sessions with SAM were very relaxing. The writing sessions with Mitzi brought so many emotions to the surface for me." “I felt very comfortable doing the yoga positions, though I have only done a couple of yoga classes"
“It was not intimidating which was welcoming for a newcomer." "The teachers made this event a worthwhile meaningful growing experience." "Our comfort was provided for in such a caring way"
"Nothing felt rushed... it was very peaceful and calming." Winter is the season when Nature rests -- but we rarely do! Give yourself the gift of an afternoon of stillness, reflection and renewal as the year draws to a close and the darkness of winter begins to yield to growing light. 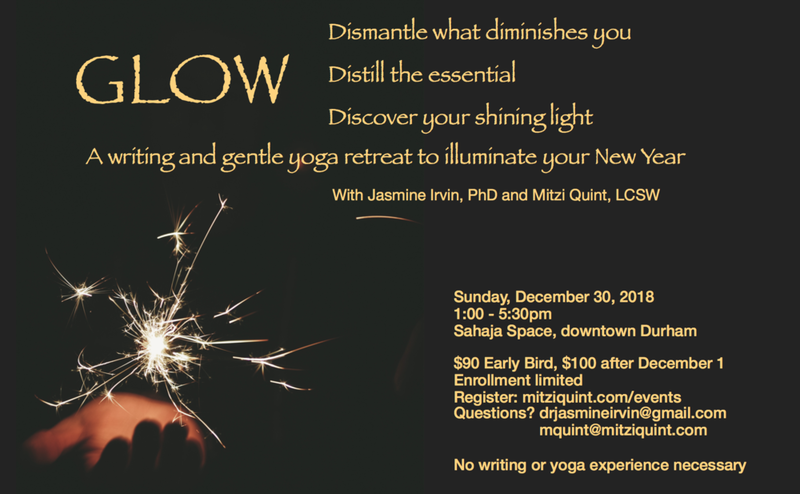 Jasmine Irvin, PhD and Mitzi Quint, LCSW will weave gentle yoga and visualization with writing practices designed for self-discovery and affirmation. This will be a time to explore freely; no yoga or writing experience is needed. Yoga props and writing materials are provided, but bring your own mat, journal and pen if you have them. Wear comfortable clothing that allows for movement, and layers that allow for temperature fluctuations. Tea and snacks will be available. Location: SAHAJA S P A C E, 123 E Parrish Street, Suite 200, is a serene, light-filled yoga studio in downtown Durham, upstairs from Everyday Magic. There is plenty of free weekend parking in front of the building on Parrish and Church Streets.